Great Halloween skull at a great price. Life-size skull features a movable jaw and removable calvarium. Dissects into 3 parts: Skull with upper jaw, hinged lower jaw and hook-on calvarium. It clearly shows suture lines, and features a movable spring-loaded jaw, cut calvarium and 3 removable lower teeth: incisor, cuspid and molar. 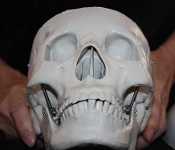 Skull can be posed with spring-loaded jaw open or closed! Size: 5-inchW x 8-1/2-inchH x 6-inchD.